In 1098, Hildegard was born the tenth child of a noble couple. In those days, it was traditional for the tenth child to be given to God. Hildegard was taken to an anchoress named Jutta, at a very young age. An anchoress lived alone in a small room connected to the church to pray and study. Jutta taught Hildegard all that she could, but she was not her only teacher. From the age of three, Hildegard had been having visions from God. As she grew older, they became more intense and showed her many things about God, the natural world and man's place in it. She also received revelations about medicines and natural healings. Hildegard was overflowing with talent as she wrote books, drew and painted, practiced medicine, wrote music, wrote a play about the virtues and conversed with many important people by letter. At 18, she had become a nun and when Jutta died, several other women had joined them in the anchor, and Hildegard became their abbess. She was an amazing woman, enlightened by God and everything she did was for Him. Her music is still played and her books are still read today, she truly was a renaissance woman and her wisdom has stood the test of time. Born into a noble family, she was instructed for ten years by the holy woman Blessed Jutta. When Hildegard was 18, she became a Benedictine nun at the Monastery of Saint Disibodenberg. 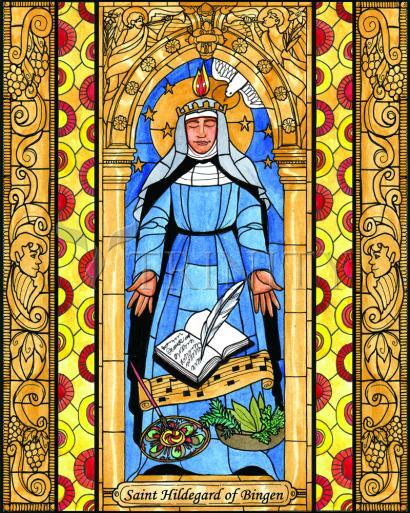 Ordered by her confessor to write down the visions that she had received since the age of three, Hildegard took ten years to write her Scivias (Know the Ways). Pope Eugene III read it and in 1147 encouraged her to continue writing. Her Book of the Merits of Life and Book of Divine Works followed. She wrote over 300 letters to people who sought her advice; she also composed short works on medicine and physiology, and sought advice from contemporaries such as Saint Bernard of Clairvaux. Like all mystics, she saw the harmony of God’s creation and the place of women and men in that. This unity was not apparent to many of her contemporaries. Pope Benedict spoke about Hildegard of Bingen during two of his general audiences in September 2010. He praised the humility with which she received God’s gifts and the obedience she gave Church authorities. He praised the “rich theological content” of her mystical visions that sum up the history of salvation from creation to the end of time.